LATEST: WINDS measuring 100km/h have been measured at Rathdowney as severe storms make their way across southern Queensland. The Bureau of Meteorology issued a warning at 6.45pm showing a widespread footprint of wild weather - their radars detected storms near Boonah, west of Brisbane, and northeast of Kingaroy. 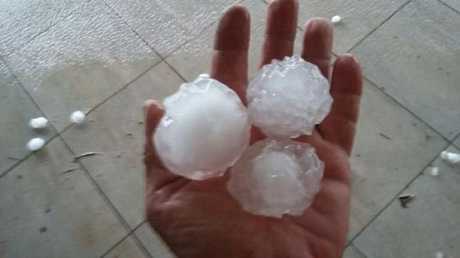 Oakey bore the brunt of the bad weather with a wind gust of 113km/h reported, as well as golfball-sized hail about 5pm. 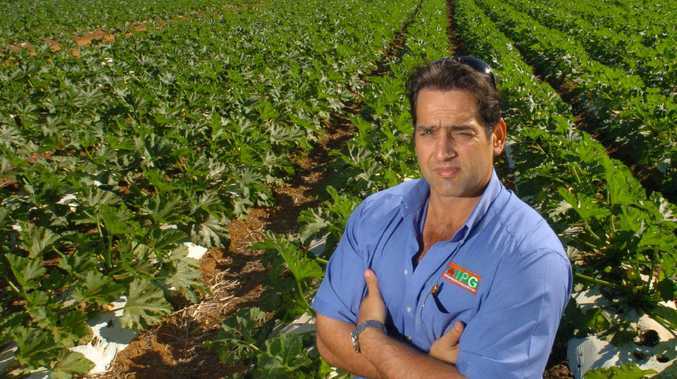 Its now Ipswich and Brisbane's turn to face the storm. BOM's latest warning, issued about 7pm, showed the severe storm travelling northeast towards both cities. Logan, Beenleigh and the town of Laidley are also due to be hit by the storms. BOM warned damaging winds were likely, as well as heavy rainfall that could lead to flash flooding. EARLIER: THE area likely to be hit by storms has expanded, with the Bureau of Meteorology issuing a storm warning for parts of Somerset, Scenic Rim, Southern Downs, South Burnett, Toowoomba, Lockyer Valley and the Gold Coast. The warning showed severe thunderstorms near Crows Nest, Oakington, Maryvale and Border Ranges National Park. BOM said the storms were moving northeast. 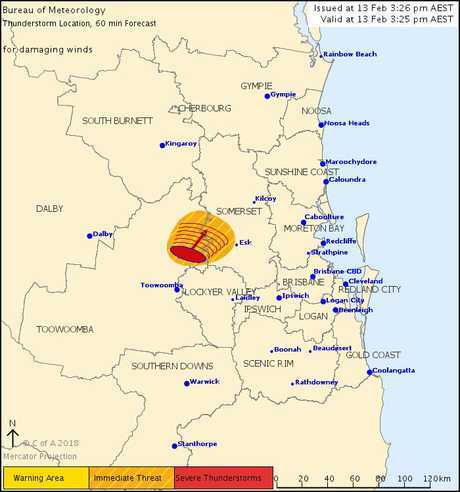 "They are forecast to affect the area northwest of Esk, Blackbutt, Linville and Yarraman by 6:25pm and Boonah, Kilcoy, the area between Boonah and Beaudesert and the area west of Kilcoy by 6:55pm," the warning said. "Damaging winds and heavy rainfall that may lead to flash flooding are likely." "Large Hail and damaging winds are likely with storms near Warwick and Oakington." Golfball size hail and a 113km/h wind gust was reported at Oakey around 5pm. 83km/h wind gust was reported at Wellcamp Airport at 4:40pm. ISOLATED storms are now affecting the Somerset and Toowoomba regions after a hot, humid day. The Bureau of Meteorology forecast the storms would move to Esk and Toogoolawah by about 4.30pm. BOM warned the storms were severe and damaging winds were likely. Other areas of Queensland are not currently including in the storm warning. EARLIER: A LARGE, humid, unstable air-mass is sitting over south-east Queensland this afternoon and the Bureau of Meteorology is saying this could lead to storms and damaging winds in some areas. Queensland Duty Forecaster Annabelle Ford said while no storm warnings had been issued there was a good chance they would be, this afternoon. "Over the whole of south-east Queensland there's a really unstable air-mass," she said. "The conditions are probably good for storms but storms can always be really hit and miss - so they could be in one area but not everyone will get one." This afternoon the BoM uploaded a map to Twitter saying severe thunderstorms were possible, or likely, for most of the state's south-east. Non-severe or damaging storms are also possible for most of central coastal Queensland and much of the Cape, according to the forecast map. "That's kind of indicative of where the moisture is," Ms Ord said of the map. "In the south-west corner there's some really dry air so while storms are possible there they're more likely in the areas where there's more moisture." Ms Ford said the nature of the system involved meant it was unlikely to lead to hail, however, she said there was a good chance of strong winds for the area south of Toowoomba. Ms Ford said that was due to a technical fact about the system which she referred to as wind-shear. Essentially this means the direction of the winds blowing along the earth's surface, or lower atmosphere, is different to the direction of the winds in the upper atmosphere. "At the moment we have light north-easterlies in the lower atmosphere and then strong westerlies in the upper atmosphere," Ms Ord said before adding that wind-shear like this often increases the severity of strong winds during a storm.